Last weekend we had a delightful four days on Maui to enjoy the Maui AgFest and the events leading up to it. This year’s festival added on an extra dining event on Thursday, plus some additional events we were invited to attend to get to know the chefs better. Four chefs from Canada also made the trip very far south, and their presence added a lot to the festivities. More on all of this soon! I swear! 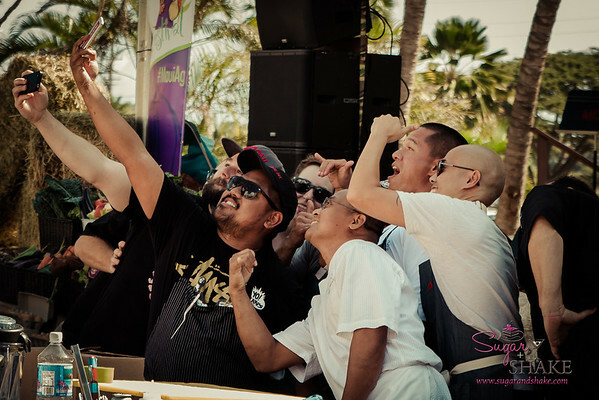 Chefs, left to right: Pierre Lamielle (FoodOnYourShirt); Sheldon Simeon (Migrant); Jessica Pelland (charbar); Joey Macadangdang (Roy’s); Isaac Bancaco (Ka‘ana Kitchen); Jojo Vasquez (The Plantation House); Eric Faivre (Grand Wailea), in black, leaning over. Not visible (and probable owner of the apparently owner-less hand on the left): Jeff Scheer (Maui Executive Catering). Disclosure: Sugar + Shake were hosted by the Maui Visitors Bureau and The Grand Wailea. Travel and accommodations were provided by the hosts, as well as entry to the Festival and the Grand Tasting, but no compensation was received for this post, and the opinions expressed are strictly my own.